Nokia, mobile leader in mobile manufacturer had launched in India its new handset, the new Nokia 6700 Slide, in six beautiful colours Raw Aluminum, Petrol Blue, Red, Pink, Lime and Purple. One may choose any colour according to one's personality and choice.The Slide 6700 can also boasts of its 2.2 inch display that allows you to see your favorite contacts on the home screen. The phone scores technologically as it is based on S60 platform and in its design with its brilliant looks. Its apps enables it to deliver high-speed data transfer. The phone comes with up to 10.2 Mbps of downloading speed and 2 Mbps of uploading speed. The phone also supports ample apps for social networking sites like Facebook and twitter. Also, a variety of videos, themes, games, apps, ringtones and trailers can be dowloaded on phone from the Nokia Ovi Store. The Nokia 6700 Slide is laid with the best multi media features like FM radio, good music and video players alongwith 2.5mm headphone jack. Its 5MP camera with Carl Zeiss lens with autofocus, LED flash is simply tempting and ask us to grab it instantly. 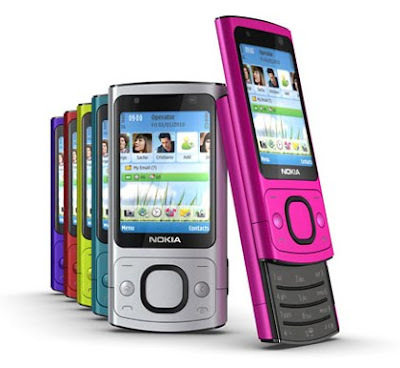 The Nokia Slide 6700 is powered by Symbian S60V3 FP2 and comes with 860mAh battery. It certainly looks like a promising handset considering its price and performance which is far better than previous Classic models. The Nokia 6700 Slide price is set at Rs. 11,500 for India. Hi its really very nice postings i enjoyed a lot to visit..